So you’ve found the perfect product for your next promotion. Now comes the tough part: What should you put on it? Even if it’s a basic t-shirt or windbreaker for your company store, it’s not simply a matter of silk-screening or embroidering your logo on the front, even though that’s what most companies tend to do. What message are you trying to send? What do you want recipients to do with the product? What’s the ultimate goal of your promotion? All of these questions help determine what you should imprint and also where you should imprint. First, consider the product. Naturally, you want people to use it, wear it, enjoy it, etc. But what’s a reasonable timeframe? If the product is associated with a specific event (a company picnic, sales meeting, trade show, anniversary, charity event, etc. ), it’s probably going to have a more limited shelf life. In other words, if it’s functioning more as a memento or souvenir, which generally means the message can be bigger, louder, more colorful – go for it! On the other hand, if your goal is repeated exposure over a long period, you probably need to be more subtle and low key with your imprint. An embossed portfolio. A golf shirt with a small logo embroidered on the left chest area. 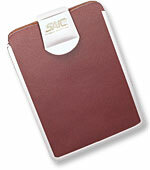 A business card case with initials tastefully engraved on the clasp. These are just two examples of how your objectives can help you decide what and where to imprint. The differentiation is one reason we typically ask so many questions when we first discuss a promotion. Remember, products are important, but they’re only half the equation. The other half is your message – what you say, how you imprint it, and where you put it. Don’t overlook this important creative process when incorporating promotional products into your next marketing program, ad campaign or recognition effort. Give us a call at 708-478-8222 or send us an e-mail to discuss this further.